One of the most significant findings from my research involving over 4000 small group leaders is that praying leaders have faster growing groups. I’ve always been intrigued by this. 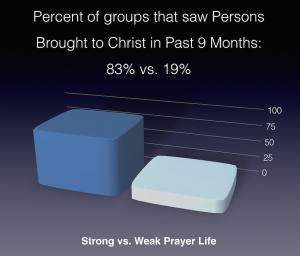 Why does something that no one sees—the leader’s personal time with God and their prayer for their group—impact a small group’s growth so significantly? I think there are four simple reasons why praying leaders have more magnetic groups. God answers prayer. Jesus said, “Keep on asking, and you will receive what you ask for.” (Luke 11:9, NLT) Praying leaders ask God to do great things in their group and he loves to answer their requests. Praying leaders are compassionate. When leaders pray for their members, they capture God’s heart for them, and people are drawn to the concern and love that they feel in a group led by caring leaders. God directs praying leaders. When we take time with God, we can better hear his voice and more clearly receive his direction. Instead of just running with our own ideas, the Holy Spirit can begin to direct things and this makes everything go better. What does this mean for you and me as small group leaders? It’s pretty simple really. Consistently take time to enjoy God. Make time with him a refreshing part of your daily routine. As you do that, take some time to pray for your small group members and your small group meeting. Ask God to do big God-sized things that show just how awesome, great and compassionate he is. Remember Jesus promised: “Keep on asking, and you will receive what you ask for.” What are you going to ask God to do in your group this week? This post originally appeared as a guest post I wrote for joelcomiskey.com in July 2014.